The American Queen Steamboat Co of Memphis announced last week that it was to acquire the 202-berth coastal cruise ships Victory I and sister ship Victory II, as well as the Victory Cruise Lines brand, from Sunstone Ships Inc of Miami. Terms of the transaction, which is expected to close in early January 2019, were not disclosed. 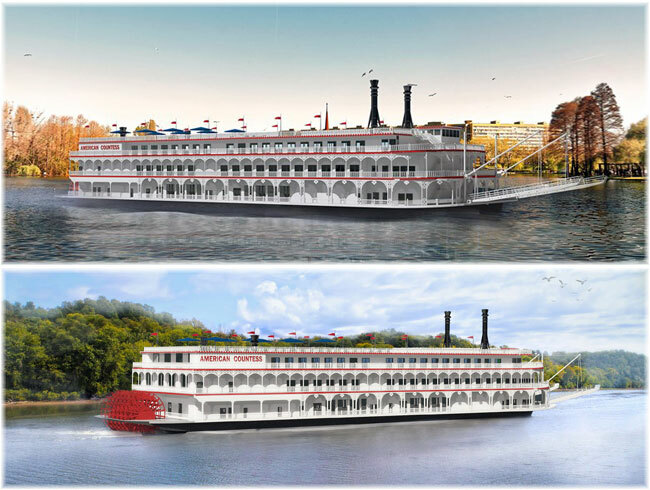 “We are pleased to purchase the Victory I and Victory II that will fuel the continued success and growth of American Queen Steamboat Company,” said American Queen’s chairman and ceo John Waggoner. Built as the US-flag Cape May Light and Cape Cod Light in 2001 and 2004, the 4,954-ton, 300-foot Victory I and Victory II are now registered in Nassau. Details of future itineraries for both ships will be announced in the coming months. The Victory I and Victory II will join the American Queen Steamboat Company under the Victory brand name, alongside the 436-berth flagship American Queen and 166-berth boutique-style American Duchess sailing the Mississippi and Ohio rivers, and the 223-berth American Empress on the Columbia. A fourth riverboat, the 245-berth American Countess, is now under conversion in Louisiana from the 257-foot gambling ship Kanesville Queen. With a new 60-foot midsection, she is due to enter service in 2020. 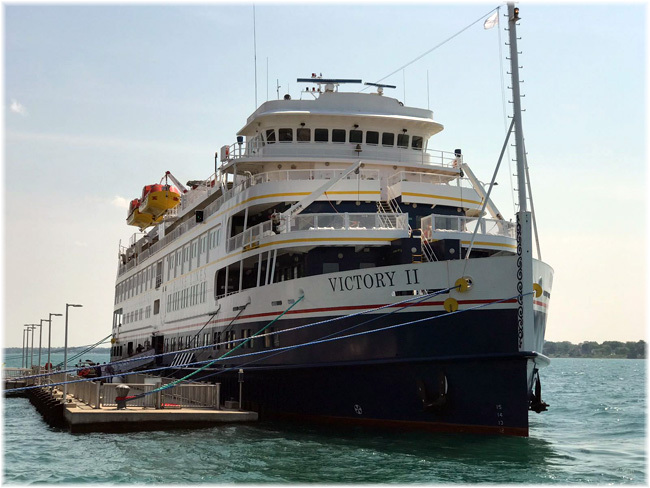 “Victory Cruise Lines has established itself as the leading cruise line on the Great Lakes, and our bookings for 2019 are already 35% ahead of our actuals of 2018. American Queen Steamboat Company’s established and strong product and brand is well-suited to take the Victory vessels and Victory Cruise Line brand forward creating one of the largest North American Great Lakes and US river cruising companies in the country,” said Victory Cruise Lines president and ceo Hans Lagerweij. 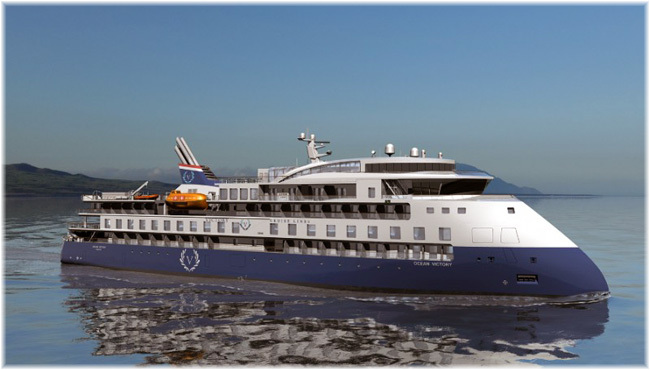 Not long before the present announcement, Victory signed a seasonal charter for a new expedition ship, the Ocean Victory, one of the 200-passenger “Infinity” class newbuilds under construction by China Merchants for Sunstone Ships. Victory was to take the Ocean Victory in northern summers starting in 2020, but it is not clear whether the charter of the new Ice Class ship will now go ahead. American Queen has also said it will review Victory Cruise Lines’ other itineraries in Cuba and the Yucatan. Meanwhile, American Queen is entering into a contract with Sunstone affiliate Cruise Management International to continue handling the Victory sister ships’ technical management and with sister company CMI Leisure to handle hotel management. These ships have largely Filipino crews, while American Queen’s own US-flag ships feature American crews. Windstar Cruises will stretch its three “Star” class ships as part of a $250 million fleet upgrade that will increase capacity by 24%. “This will be a true game changer for Windstar and our small-ship cruise experience,” said Windstar president John Delaney. 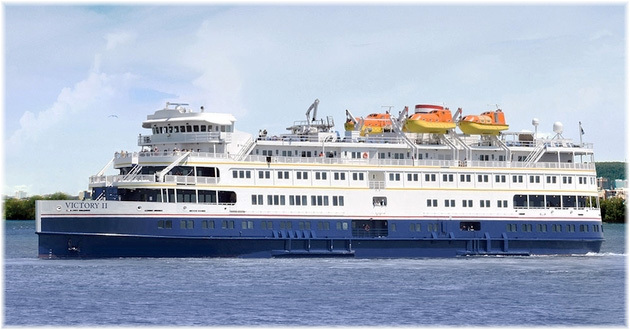 The Star Breeze, Star Legend and Star Pride will be lengthened in succession between October 2019 and November 2020, increasing capacity for each ship from 212 to 312 passengers. Italian shipbuilder Fincantieri will do the work in its Palermo yard. 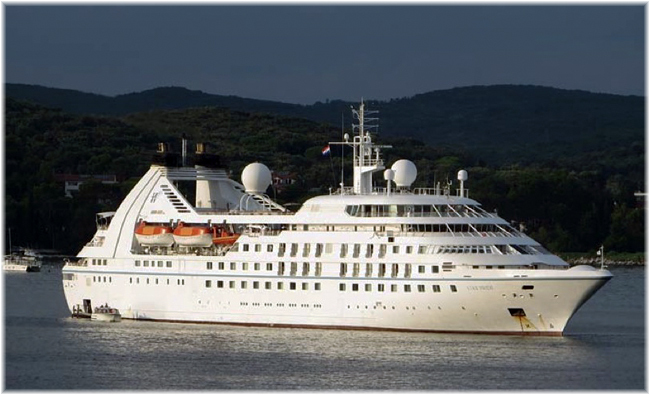 Windstar will add 50 cabins to each ship, bringing the total to 56, at cost of more than $267,000 per passenger berth. This compares with $69,000 per berth for Hapag-Lloyd’s 420-berth Columbus, a similar sized ship built twenty-two years earlier, in 1997. Each Windstar ship will also combine existing suites to create two three-bedroom, two-balcony Owner’s Suites. The additional space will also enable the addition of new public areas, including two dining locations, shop and retail space, an enlarged fitness center and a spa. Two new dining areas include an “intimate, alternative dining restaurant” and a casual barbecue space adjacent to the top-deck Star Bar. The ships’ Veranda restaurant will be expanded. The swimming pools will also be enlarged, reconfigured and elevated to offer better views. Finally, the mid-ship section will see the addition of another elevator. Other changes include a new tender loading area located amidships and two new 90-passenger tenders that will ferry guests to shore when ships are at anchor. Each of the three ships will be cut to allow the installation of a new 84-foot section, which will still keep her length overall to 522 feet, small enough to allow Windstar to access the smaller ports and harbours that it favours. Delaney said the initiative would go beyond new suites and public spaces to more fuel-efficient engines that generate fewer emissions. The seven existing engines will be replaced by four new ones that will run on cleaner fuel. 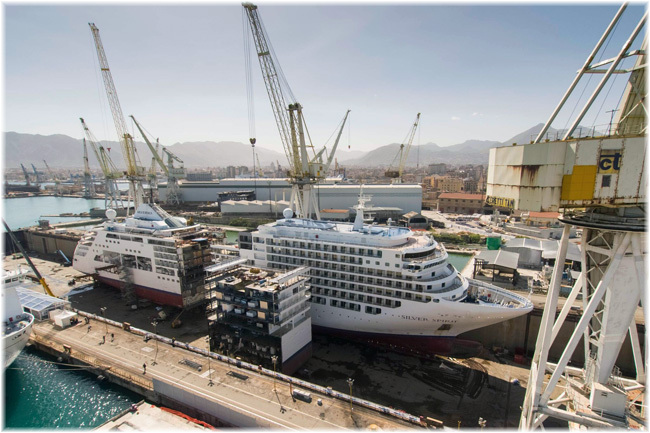 Fincantieri Palermo has done 79-foot stretches on the four MSC Opera class cruise ships and a 49-foot stretch on the Silver Spirit and is now installing new 95-foot midsections in the Grimaldi Lines cruise ferries Cruise Barcelona and Cruise Roma. With the Star trio being expanded to 312 berths, the same capacity as the Wind Surf, this leaves the 158-berth Wind Spirit and Wind Star as the small ships in the Windstar fteet. Almost a year ago, on December 1, 2017, Maersk Line acquired Hamburg-Süd and closed down the German line’s passenger services. One of the areas worst affected was New Zealand, which lost passenger service from both coasts of North America. Service to and from Europe having closed earlier when the ships serving that route had changed. But now, with the introduction of the 5-passenger British-flag CMA CGM Amber to the Anzex line, passenger service has been reinstated between New Zealand and China, as well as with Brisbane on the return voyage. Ports served in New Zealand include Auckland, Port Chalmers, Lyttelton, Napier and Tauranga, while in Chinese waters, the CMA CGM Amber serves Hong Kong, Yantian, Keelung, Shanghai, Ningbo, Shekou and Kaohsiung. Connections to and from US and European ports can also now be made over Hong Kong or Shanghai. The voyage from Tauranga to Hong Kong is 14 days and from Shanghai to Auckland 21 days, while Hong Kong to Brisbane is 22 days. Fares are €110 per person per day in a double cabin and €130 per day in a single. 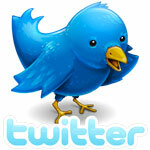 There are also fares of €130 per day double or €150 single for voyages of ten days or fewer. To this must be added a CMA CGM management fee of €45. In addition to service to Hong Kong and Chinese ports, four 10-berth ships operate between Australian ports and Singapore but do not serve New Zealand. Singapore to Southampton is achieved in 22 days.